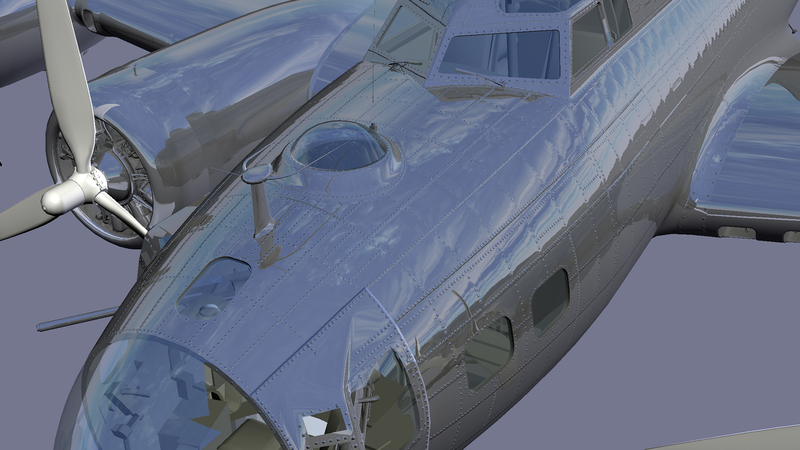 Work continues at great speed on new elements of DCS World War II. 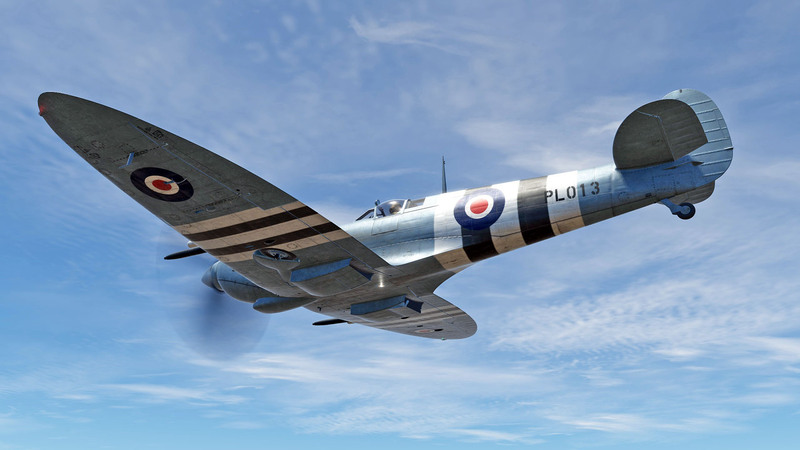 Much of the work is focused on DCS: Spitfire LF Mk IX and the Normandy map, and both are, or will be soon, going into internal test! This is always a good sign that we are approaching an Early Access release. In addition to the Spitfire and WW II era map, we also continue working on new AI units to inhabit the map. Last week we had a look at the Tiger tank, this week we offer first looks at the Panther and a work-in-progress image of the B-17. 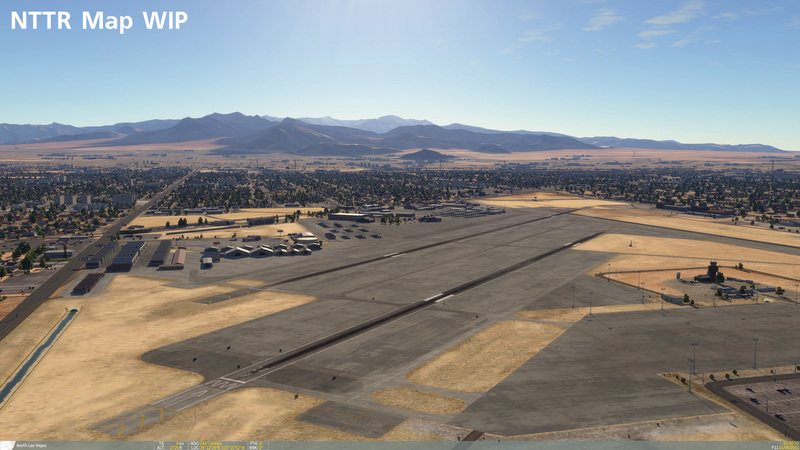 In previous newsletters, we shared images of the new airfields coming to the NTTR map. 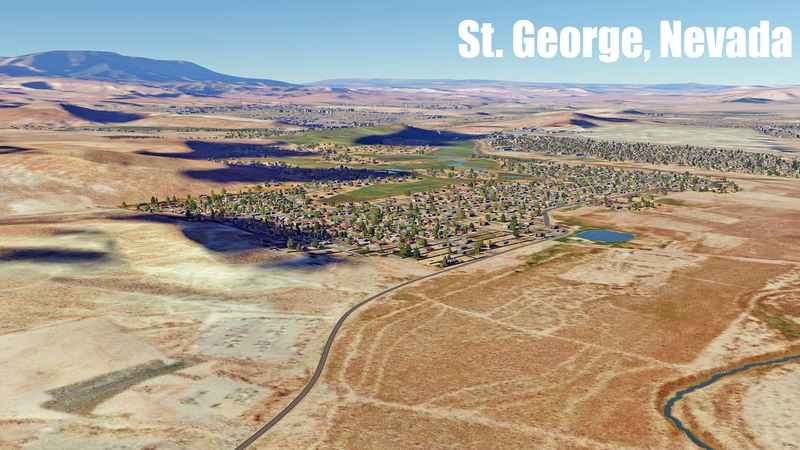 In addition to the airfields though, we will also be adding many new small and large urban centers like St. George, Laughlin, Tonopah, Goldfield, Caliente, and many others. Although most of the art work is done for the Hornet (minus a few external stores), most of the current work involves the coding of the various systems and flight dynamics. In addition to that, we are also very busy with documentation and the refining design specification as we gather new information. Once the project gets closer to Early Access, we can start talking more about this project. In addition to the Hornet, NTTR, and DCS WWII tasks, another high-priority task for us is wrapping up DCS World 2.5. The primary function of 2.5 will be to combine both 1.5 and 2.0 into a single executable and thereby being able to access all maps from a single program. We are close with the last two big items being the resolution of how we will render forests and trees in 2.5 and updating some of the old objects to our current format. Once those two items are addressed, we will start releasing some new images and videos of what is in store. Also starting today and lasting for the next four days, Steam is having a sale on all DCS World products, with a 30% discount! Starting today at 1500 GMT and lasting until Monday, July 18, 0900 GMT, you can spend up to 60% of your bonus points on most module from ourE-Shop. This is a great way to finally spend this bonus points with a huge discount on our great modules! Two weeks after publishing DCS 1.5.4 in Open Beta, we finally managed to clear up the critical bugs and will publish the patch for DCS World today. Thanks again for all your feedback during this short, yet very effective Open Beta phase! This log is sum of previous two logs of 1.5.4 Open beta plus several new positions. AI aircraft. The visible restrictions of sensors will not inherit from previous mission. Example: if previous mission was at night the optical sensors will not have very limited range in the next daylight mission. In-cockpit TrackIR functionality corrected. Influence of mouse and default camera position was switched off. Modified Special Options interface according to new appearance. Changed EB and CC available tasks in ME. Added CC Sea Eagle missile launch capability for AI. Last friday we released our latest v0.9.4 update. While this update hasn´t added any new content or features to the sim, there has been some valuable progress in particular to graphics & Artificial Intelligence. A lot of man-hours & late nights have also gone into fine-tuning AI performance and behavior in close racing conditions across the board – as a result v0.9.41 features our best, most well-rounded AI yet. Things continue to progress nicely towards v1.0, some are further along than others but while official release will not represent the end of new features or content for AMS, we´re pushing to wrap up a rock-solid v1.0 within the next few weeks. With single player gameplay now mostly in pretty good shape, focus now is on wrapping up remaining functionality tasks, adding a few more options & ironing out the most significant bugs. Multiplayer in particular will be at the forefront for v1.0 – the AMS Dedicated tool is already available for those who own AMS via Steam Tools, and if you are a league runner you may also PM me for a free Steam key for the Dedi Tool. Unfortunately we have had a setback with implementation of driver animations as the developer in charge has left the project, so that´s one feature unlikely to make it in time for v1.0. This remains an important development for AMS though and we´ll be aiming to add it post-release. We´re pleased to announce the Virtual Xperience portal (VX), the place we hope will help stimulate the community´s engagement with & around Automobilista. From VX you´ll be able to check the multiplayer lobby and join sessions, register & find a league for your favorite car in a time slot that suits you, measure your hotlapping skills in the AMS leaderboards, join one of our official public servers, share your setups & replays and more. The most complex VX module is the AMS leaderboards and its integration with the game, so this is what @Luis Miguel, @Dave Stephenson & @Thiago Izequiel who are the headlining this project have mostly have been focusing on – currently only AMS Beta v0.9.5b is hooked up with the leaderboards so those who have it can already get your times up there We hope to integrate the system into the next EA release as well. The leaderboards are linked to the Time Trial mode, which as you may have seen is effectively a practice session run under fixed configurations (but not fixed car setup) – noon time, max track conditions, no AI, no tire wear or fuel consumption – the sole purpose is scoring hotlaps to the leaderboards & future hotlapping competitions. Player times are automatically synced up with the leaderboards via Steam, and you can check how it ranks against the others both from the in-game monitor while running a time trial session, as well as from the Virtual Xperience leaderboards, selecting the car / track combo you´re looking to check out. Further good news is that VX should be hopefully nicely complemented by developments being made to the Sim Racing System to better integrate it with AMS – @Henrique Alves has presented more info about it here. Very glad also to confirm the Brit Pack as our initial lot of premium DLCs for Automobilista. Besides the previously announced 3 tracks (Brands Hatch / Cadwell / Oulton Park) and theUltima GTR (both road and GT versions), we will also be adding the MCR Sports 2000 and several Caterham models to the roster. The 6 components of the Brit Pack will be sold in a package as well as individually via Steam, with prices at release ranging from US$ 1.99 (for the MCR) to US$ 4.99 for each track, or US$ 19.99 for the complete pack. You can however secure all this content, plus all the other upcoming premium DLCs byacquiring our membership packs , currently selling for US$ 54.99 (full membership including base game) / US$ 24.99 (membership upgrade for those who already own AMS). Please note that these prices will still be upgraded to US$ 59.99 / US$ 29.99 respectively in time for AMS v1.0 release, so those who have not yet joined in should push not to miss the current pricing. The membership pack also grants access to the Reiza 51 dev forum, Beta development version of AMS, and the chance to try out all this content in advance as they reach beta status. The contents of the Brit Pack are all officially licensed and we´re working in close proximity with the car manufacturers to ensure maximum accuracy; Alex has recently done recon trips to Brands Hatch & Cadwell Park, with Oulton Park scheduled for the end of the month. We estimate the initial components of the Brit Pack to become available soon after v1.0 release, sometime in july, with Beta hopefully before the end of the month. 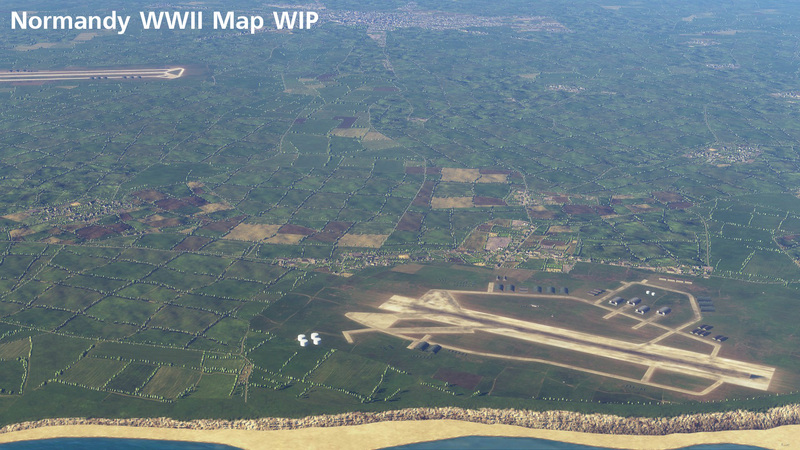 Development of the specially created “DCS: Normandy 1944” map for DCS World War II continues its development at a fast pace. 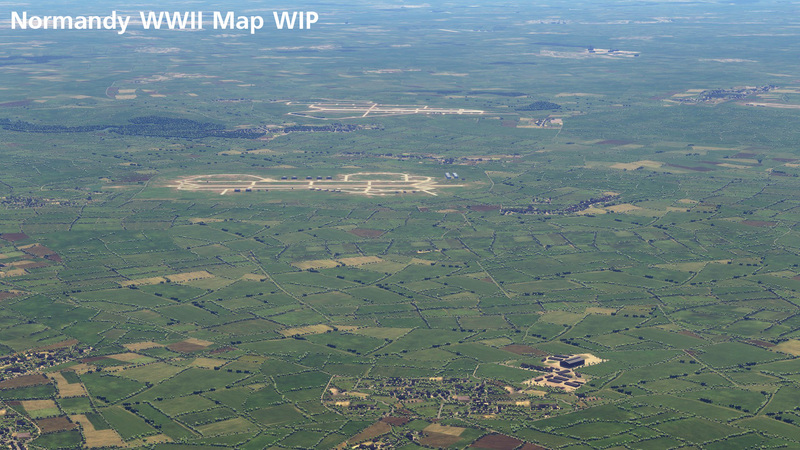 Currently, the main effort is focused on airfields with different types of surfaces (a first for DCS World). For example: we are implementing SMT (Square Mesh Tracks) surfaces, which were widely used by the Allies for temporary airfields in Normandy following the landings. We are also developing the possibility to place airfields on the map using the Mission Editor (another first for DCS World). After the successful, final release of the DSC: F-86 Sabre and DSC: MiG-15bis modules, the Belsimtek team is now focused on bringing DSC: F-5E Tiger II to Early Access within the next month. In the meantime, Belsimtek continues to edit the F-86F Sabre English manual and prepare DCS: Mi-8MTV2 for its final release. The radar, optical sight, jettison system, gun use, launching of air-to-air missiles, air-to-ground rocket use, and flare and chaff countermeasures are integrated into the model and the aircraft’s Weapon Control System (WCS). All the above-mentioned items are now operating as described in F-5E operations manuals. I know its a been a while since I posted anything but I do have some news. I’ve recently been (slowly) porting Lunar Flight to be a DX11 targeted application using Unity 5. One of the reasons for moving to DX11 is that Oculus is dropping support for DX9. The good thing is that in the near future Lunar Flight will run faster and look better than it has ever done thanks to Unity’s new lighting system and DX12 on the horizon. This is in preparation for the consumer Oculus hardware and Valves Vive HMD. Once the inital port is complete I want to look into adding some new content including some new Mission Types, a new DLC Planet/Moon and a make over of the UI and LM/Cockpit model which I want to include an animated Flight Suit and Throttle and Joystick in the cockpit. 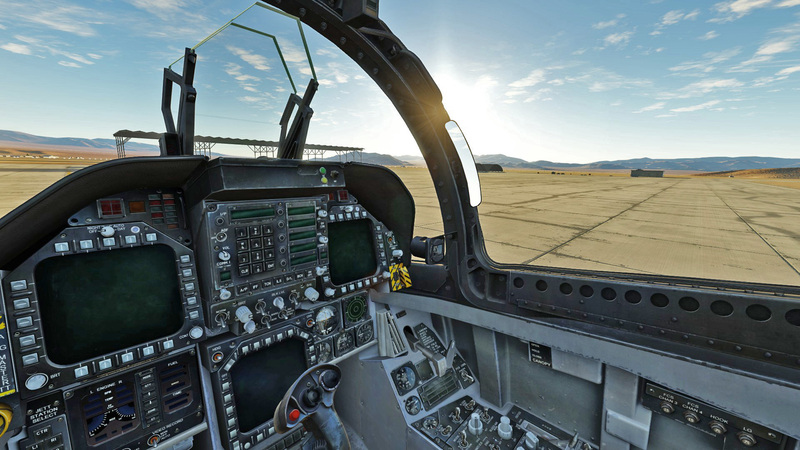 Each day we are making more progress in moving DCS World 2. Since the previous newsletter, the team has made great progress on AI landing logic, an all-new multiplayer interface that includes such features as Favorites and Filters, new smoke effects, improvements to the lighting and shadows, replaced the general ground texture with a higher resolution one, increased new terrain graphics performance, the ability to load and work with different maps in the Mission Editor, improvements to the Graphical User Interface (GUI), dedicated server, and a new protection system. We often read questions regarding how the current Black Sea map will look in DCS World 2. Rather than try to describe this in words, we have included a non-edited gameplay video of the freely available Su-25T Instant Action mission “SAM Killer”. We hope this will paint a clear picture. 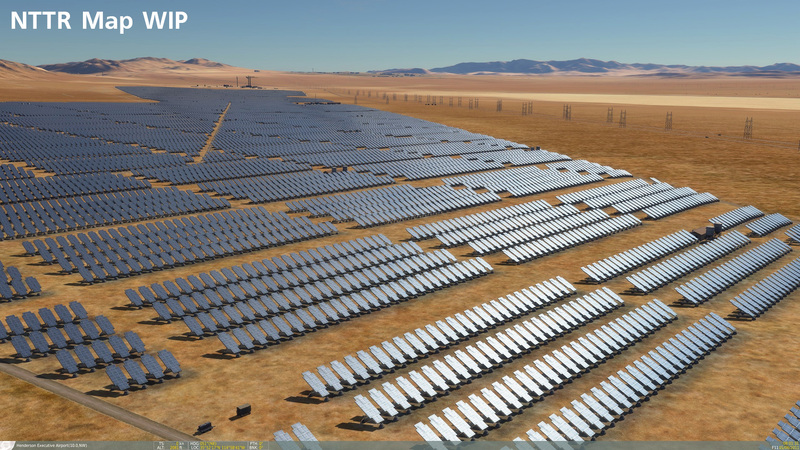 We are burning the midnight oil and we will release an alpha of Nevada Test and Training Range map once we feel it is ready. Before we can do so though, there are still several items that need to be addressed. These will also include: completing the new multiplayer interface, performance optimization, various unified .exe issues, remaining crashes, and some night lighting issues. The next aircraft module to be released by Eagle Dynamics will be the L-39 Albatros. The front and back cockpit are nearing completion as you can see in the included video. This video also gives you another look at the Black Sea map in DCS World 2. Primary aspects to still complete are an all-new external model and the completion of the cockpit systems and flight dynamics. The biggest innovation for this aircraft, and a big part of our reason choosing it, was the inclusion of multiple network players in the same aircraft. This technology has been a big focus of the team as of late. This has also been a big reason for our re-design of the multiplayer interface. It is to be determined if this features will be part of the initial beta release. 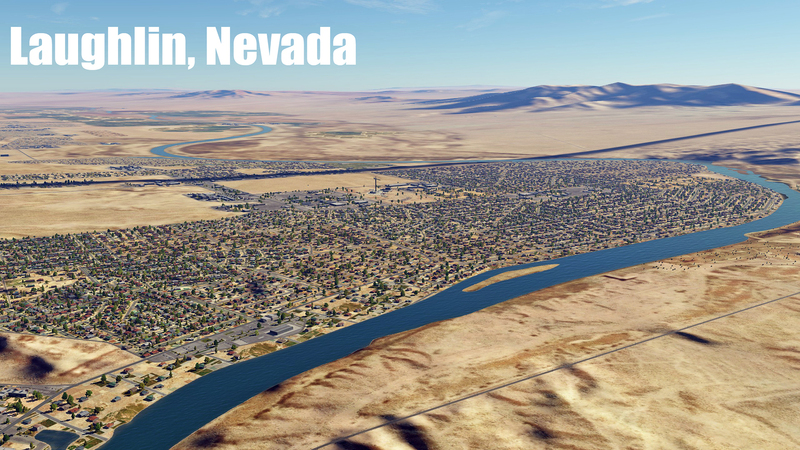 We are further improving the Nevada map and moving it closer to Alfa. Items being worked on include adding the various TACAN and VORTAC stations, improving the mountain textures, improving ground object shadowing, and adding collision models to most ground objects. Included is a video demonstrating the urban density possible with DCS World 2 and the tremendous sense of speed it provides when flying at low altitude. No, no time acceleration is used. When not working on the Nevada map, our map team is making steady progress on the Strait of Hormuz Map. Most of the airfields are now placed and a great deal of work is being done on manually improving the elevation mesh and textures. However, this map still has a long way to go with items such as airfield taxi routing, water textures, airbase lighting, ground object placement, navigation aids, and ATC still needed to be addressed. A lot of new work is going into Combined Arms in regards to improved user control (particularly from the external unit movement control), intercom messages, and improved AI. While a bit too early to show off these new features in this newsletter, we hope to be showing these advancements off soon. Work continues on the object models, cockpit systems and flight models, but there is nothing new to show this month. 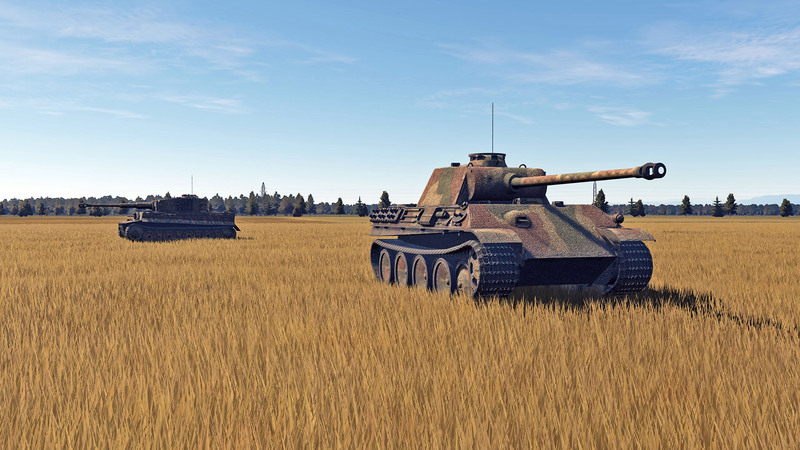 Work is mostly focused on the air-to-ground radar that is making good progress; the team is now starting to create the various sub-modes such as the expanded modes. We have included a couple of images that show samples of the new air-to-ground radar technology that is based on radar reflectivity logic. When there is sufficient new news to justify a newsletter, they will be provided. However, there is no set schedule.